If you asked most people whether Christianity is growing or dying around the world, I’ll bet they’d choose the latter. At least in the U.S., Christianity is taking some really big hits from the New Atheists, from secular media and from the academy, where one can hardly admit to being a person of faith without being (fallaciously) considered a bigot, backwards and brainwashed. Much like the misinformation and disinformation of Christianity’s first centuries, dispelled by capable apologists like Justin Martyr and Athenagoras, reports of Christianity’s demise are greatly exaggerated. As the above chart from tothesource.org shows, Christianity has experienced significant growth–just not here in the West. While the West has turned to devour itself from the roots up, the East has discovered a new source of hope, liberty, meaning and a moral compass. At least that’s my opinion having experienced that same personal transformation and compared notes with many others in my three trips to India. And do I as a modern, Western Christian lament the fact that Christianity may become an “Eastern Religion” in a few generations? Well, of course, but I lament the West, not the Faith. Christianity HAS NEVER been a “Western Religion” in the sense that the West is the genesis of Christian faith! Indeed, just the opposite is true. We in the West have messed the legacy of Christ and the Apostles up in many ways, institutionalizing it, domesticating it, using it to justify occasional atrocities (even one is inexcusable). But that’s been OUR fault. Not the faith that arose from the fertile soil of the Ancient Near East. May it take root there and beyond once again, and grow to shade and nourish millions from the fallen condition of the world and the missed-mark of human religious institutions. To read the excellent, balanced article, click the link below. Silky vocals, poetic lyrics, pristine production. I can’t wait to hear the whole record! My friend Joe Moralez is working on his second independent release. If you like it (and you will) check out his KICKSTARTER page. Should be immune to tumorous growing greed. Or did the trial metastasize her soul? She turns her head: the cottage by the sea! Remitting her to host the reunion. 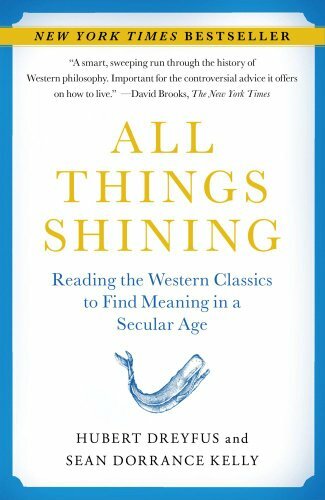 I ran across this book, All Things Shining: Reading the Western Classics to Find Meaning in a Secular Age by Hubert Dreyfus (Berkeley) and Sean Dorrance Kelly (Harvard), while browsing the philosophy section at Barnes & Noble. It grabbed my attention by quickly calling out the exhausting meaninglessness of modern life and the hopelessness of nihilism. Admitting that a loss of the sacred is the source of both maladies, the authors propose. . .ahem!. . .a re-appropriation of polytheism, based in the ancient Greeks’ openness to the world as a gift of the gods. The central source for the re-sacralization of postmodern life is Homer, whose attributed writings provide, admittedly, a fountain for Western culture. So far, I have found the Dreyfus-Kelly analysis of the emptiness of existentialism and its legacy to be incisive. Their narrative analysis of decline since the Enlightenment resonates with what I learned under the best seminary profs. Of course, their prescription is no cure, in my view. Neo-paganism provides no more of a moral compass for the future than did paganism in the ancient past. I’m only about 30 percent in to All Things Shining, but I am committed to finishing it before I pick up something else. . .except for this book: Wayfaring: Essays Pleasant and Unpleasant. In a recent post, I admitted my newfound-old-love for the essay. 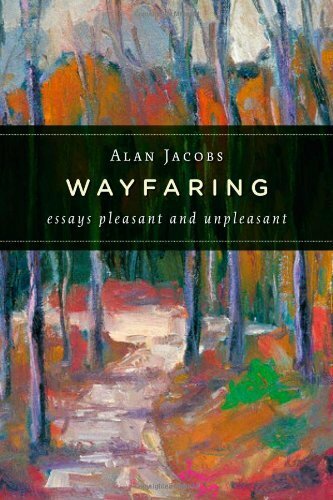 Alan Jacobs has provided a collection of thoughtful short pieces that muse on such subjects as “the usefulness and dangers of blogging, the art of dictionary making, the world of Harry Potter, and an appreciation of trees” (Amazon.com). I hope to follow Alan’s Christian mind on a journey that will help me organize my own thought life and writing. I have a few other books I absolutely want to read in various categories: science fiction (The Mote in God’s Eye by Larry Niven); theology (Heresy: A History of Defending the Truth by Alister McGrath) and biography (Bonhoeffer: Pastor, Martyr, Prophet, Spy by Eric Metaxas). But by far, the best find of 2011 and most promising read of 2012 is a tome by newly-appointed professor of New Testament and Biblical Theology at Westminster Theological Seminary, G.K. Beale. One thousand pages of pure fun! And a bit of redundancy. 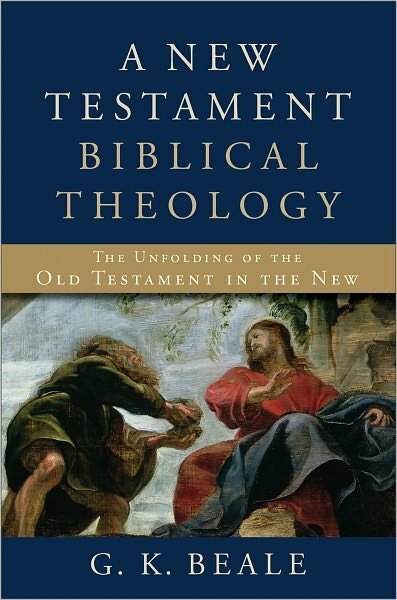 I pre-ordered the hardcover premier of A New Testament Biblical Theology: The Unfolding of the Old Testament in the New based on my prior exposure to Dr. Beale’s teaching. I knew this would be his magnum opus. I was not disappointed. Two of his previously published works, We Become What We Worship: A Biblical Theology of Idolatry and The Temple and the Church’s Mission are substantially summarized, applied and/or reproduced in this book, along with more of his writings including scholarly articles, and lectures. The groundbreaking (and painstaking) work of bringing the disciplines of biblical studies and biblical theology together with previously uncharted territory in New Testament theology makes this book the ONE that people with my bent–a love of the Bible-as-canon and dissatisfaction with the logical categories and proof-texting of systematic theology–absolutely must acquire and devour. I plan to literally (figuratively) soak in this book all year long, hauling it along as a companion for Bible devotion and teaching prep as well as carefully reading key chapters and summarizing them. I’m about 80 pages in, with several other relevant sections highlighted and cross-referenced. I could gush more–about Dr. Beale’s unassuming style, his love for the biblical text and its Author, his plain-spoken weaving of eschatalogical themes into a practical reading and application of the New Testament–but I’d better shut up until I’ve read more. If you want a better idea of the scope and significance of this book, check out the synopsis and comments at Reformation Heritage Books, where you can still get the pre-order price, I think. One critical observation: there is quite a bit of redundancy in this thousand page monster, but I’m choosing to view it as reiteration. Repetition is pedagogically (and theologically) sound, even if stylistically annoying. Saw this over the weekend; so, a purely sociological phenomenon, or evidence of genuine revival? The return to religion – Telegraph. For many years it was accepted that Christianity was all but dead, an anachronistic relic of the past whose foundations had been destroyed by modern science and rationalism, before being left behind by the cultural and sexual revolution of the Sixties. The figures seem to bear this out. ..